This recipe is perfect for brunch, lunch or dinner. 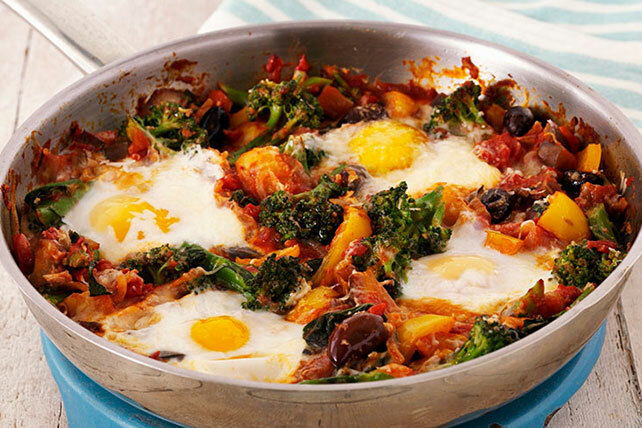 Flavourful vegetables get topped with fried eggs in this Egg and Veggie Skillet recipe. Heat dressing in nonstick skillet over medium-high heat. Add garlic and ginger, cook until fragrant. Add peppers, mushrooms and broccoli; cook 3 to 5 min. until crisp-tender. Add olives and water; stir and cook 4 min. or until liquid is almost evaporated. Add soy sauce; mix until well blended; set aside. Heat oil in medium skillet over medium-high heat, add eggs, cook until bottom of eggs are crisp and yolks are partially set. Place on top of stir-fry mixture. Serve immediately. Sprinkle with Kraft 100% Parmesan Shredded Cheese.